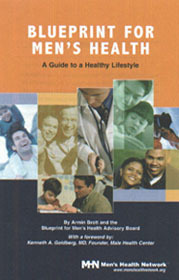 This book discusses the main health issues that men face today. 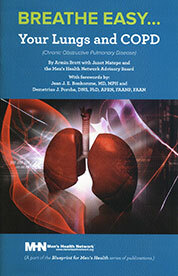 Each chapter focuses on a single condition or group of related conditions effecting men. 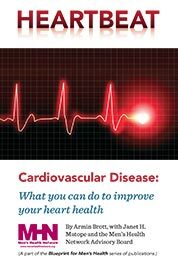 This 70+ page book discusses the factors that increase health risks, shows how to recognize symptoms, and gives practical, easy-to-implement prevention strategies. We've all heard the expression, "It's all in your head." Your mental health affects everything: your mood, your physical health, your behavior, how you sleep, your appetite, your relationships, your social life, your performance at work or school, and more. This book was written to provide men of all ages, and those who love them, with important and realistic perspectives about mental health along with realistic and practical approaches that can make a difference in their lives. Experts (psychiatrists, physicians, psychologists, public health experts, counselors, and social workers) with different perspectives have come together to provide insights and reflections on the emotional needs of men while explaining how men can ask for help, with dignity, when needed. This book highlights common signs and symptoms of trouble to help men and those who love them recognize the need for intervention, and suggestions for dealing with everyday problems when intervention may not be needed. Ola Akinboboye, MD, The Association of Black Cardiologists, Inc.
By Armin Brott With forewords by Jean J. E. Bonhomme, MD, MPH and Demetrius J. Porche, DNS, PhD, APRN, FAANP, FAAN, and comments by Richard Allen Williams, MD, FACC, Founder, Association of Black Cardiologists, Inc. This toolkit was developed to educate, empower, and provide support for males who are caring for a loved one with Alzheimer's disease. Whether you are a husband, brother, friend, son, or partner of someone who has Alzheimer's, we want to ensure you are prepared and have the knowledge, support, and resources needed to take care of your loved one to the best of your ability. 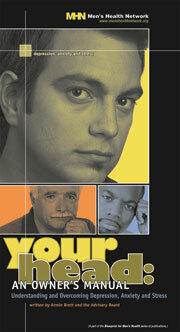 Men's Health Network is dedicated to building healthy families, one man at a time. 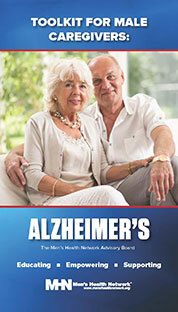 This toolkit provides an explanation of Alzheimer's disease, the common behaviors presented by someone diagnosed with Alzheimer's, options for treatment, and tips/strategies on communication and caregiving. There are available resources and advice on how to take care of yourself throughout the caregiving process, because if you aren't caring for yourself, it will make caring for your loved one more difficult. Remember, you are not alone! At least 1 in 4 people in the U.S. have stomach- or intestinal problems that are so severe that they interfere with the person's daily activities and quality of life. Problems with the intestines or digestion are collectively referred to as Gastrointestinal (or GI) Disorders. 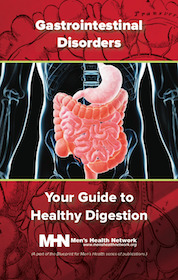 This 24 page book provides a guide through the Gastrointestinal (GI) tract, defines several stomach- or intestinal problems, explains diagnosis and treatments, offers tips for prevention, and guidance for communicating with your healthcare provider. 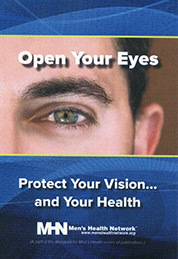 When you think of all the things you need to keep track of to stay healthy, do your eyes come to the top of the list? Staying on top of your eye health is not only important for maintaining your vision - it is also connected to other areas of your health. This 16-page, self-cover booklet discusses some common eye diseases, as well as injury, and what you need to know in order to recognize the symptoms and get the treatment you need.